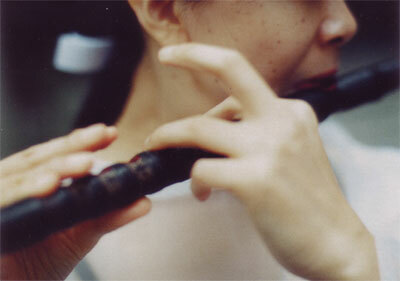 Noh-kan is a Japanese flute used in Noh- and Kyogen-plays. It is also played in Kabuki. There is no definite evidence how and when noh-kan was created to its present form. It is conjectured that noh-kan borrowed a basic construction of ryu-teki (1) and was improved with drastic change in construction. 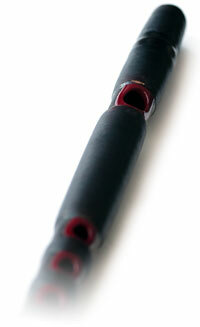 Noh-kan has an inner bamboo pipe inside the outer bamboo pipe. The inner one appears between the mouth piece and the first finger hole. The length depends on each instrument, approximately 10cm or so. 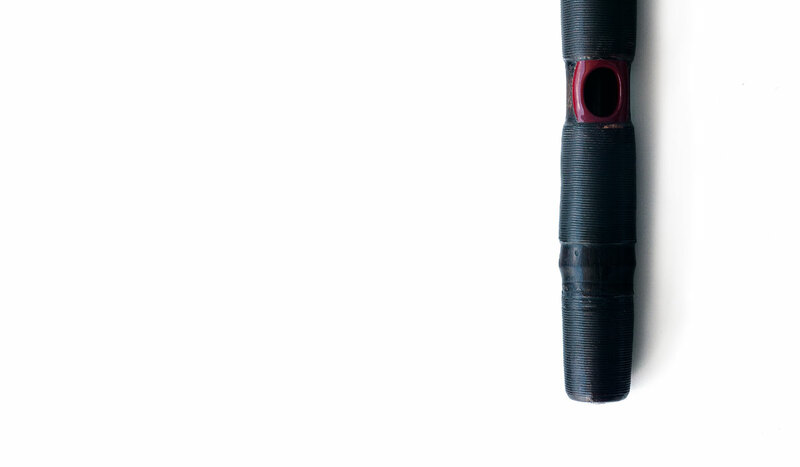 The part having another pipe inside is narrower in diameter than the other parts. This complicated construction makes noh-kan rather out of tune, and at the same time gives its unique quality of tone. Due to this uniqueness of construction noh-kan does not have an octave relationship between the low and the high scale like other ordinal flute families. The pitch difference of each tune in the low scale is rather wider than that in the high scale. The tonality of noh-kan is sharp and powerful as if the energy increases when a river drifts into a narrower water way. The present construction might not be said to be an “improvement” since it does not make the instrument easy to play but rather makes it difficult to control playing. Noh-kan in noh plays is not accompanied with instruments nor songs that are tuned in exact pitch. The pitch of noh ensemble is decided by power balance of players (meaning players’ technique, stage experience and other elements) in each performance. You can say it is as if each player pushes and pulls with his art energy, and finally tunes into the practical pitch, tune and atmosphere of the day. You have to respond within a breath on the stage and to be open to which way the energy of the entire players on stage wishes to go; for example high and light, deep and dark, fragile and dreamy, powerful and aggressive, and so on. The important point is how suitable and nicely you can play. Noh-kan is required to express various atmospheres in noh stories. Expression differs upon which season a story has occurred, for instance you express vague air in spring, sadness in autumn, stillness in winter, and also physical scenery of characters, and other background elements of the story. For fulfilling such a purpose, noh-kan had discarded the concrete scale in the melodies; however, it has gained capability to express abstract elements more with expanding the range of tune quality. This is a mere possible estimation on contemplating why the present unique construction was created. I do not belong to the group which performs traditional noh repertoire. I am simply a noh-kan player, who feels playing noh-kan is my matter. In other words, it is “the calling”; the way to fulfill the duties (or art) of life given to me. I very much feel that there is still unknown music kept in noh-kan. I believe that noh-kan can convey sincere echo which sympathizes in our heart and body with such yet hidden treasure. I truly want to find such precious sounds for me, and share them with you along with my performance. Ryu-teki is one of the three kinds of flutes used in Gagaku, which is another traditional music in Japan, and its repertoire is combined mainly with music introduced more than 1000 years ago from foreign countries (China, Korea, Vietnam and eastern regions) and music native in Japan. Ryu-teki comes from China and its scale is based on Pythagorean scale (perfect fifth interval).